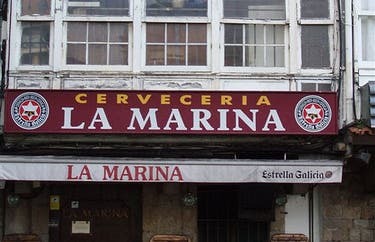 This tavern stands in the historic site of Miau de la Marina, in a building where trawlers were once kept. It's a typical brewery, with an economical menu of the day and a variety of foods on offer: tortilla, octopus, peppers, croquetas, calamares, and raxo. To drink, there are some wines, and a limited selection of beer and sangria, for the tourist. They have a terrace that's open all year, because it is quite protected from the weather. Open daily from 10:30 h to 17:00 h and from 19:30 h to 01:00 h and the tavern accepts credit cards.